As consumers of online learning, whether learning informally through YouTube or formally through a web-based training (WBT) at work, we know which tank and which are great. While we rarely stop and consider WHY a certain e-learning experience was enjoyable and of high value, for those of us who are tasked with designing and delivering superb online learning experiences, we are wise to stop and ask a simple question. What are the attributes of effective e-learning? Experience – How do we acknowledge the experience our learners bring with them to this learning endeavor? Engage – How do we create curiosity for our learners to want to know more, as well as understand what’s in it for them? Energize – How will we surprise consumers of online learning? How might humor be used? Every 7 Minutes – How will we touch the heart of our learners and make an emotional connection at least every 7 minutes? Eats – Culture eats strategy’s lunch … how well do we know our target audience and the parameters of what they will explore or embrace when it comes to innovative e-learning? Each Objective – How could we, and how well have we addressed and reached the desired results represented with the few learning objectives of this online learning experience? Consumers of online learning experiences shouldn’t need to see or know why it “worked” and was great. Designing effective e-learning is an art. And it begins with our awareness and understanding of the attributes of effective e-earning. Only then can we begin to think and build innovative, outside-of-the-box online learning solutions. I try to hire Rock Stars. I try to develop Rock Stars. No, I am not musically inclined at all. And no, I do not work in the music industry. But I desire to work with a team of fabulous people who enjoy the work they do, bring the best of who they are to work, and actively seek to grow, improve, and contribute. Those are attributes of what I call the Rock Star engaged employee. Do these people arrive at employment’s door as a Rock Star? Sometimes. But unless leaders know what they are searching for and are conscientious to develop their team members in the 3 A’s, odds are high that even the most ambitious and talented employees will wilt over time. Aptitude – Do I notice hints that suggest what they may be good at? Am I socially aware and in tune with my team members as unique individuals? Am a “student” of my employees? Ability – Do I develop my people? Am I taking the time to provide external learning opportunities, as well as investing time to train and coach my team members? Am I cultivating their talents, knowledge, and skill-sets? 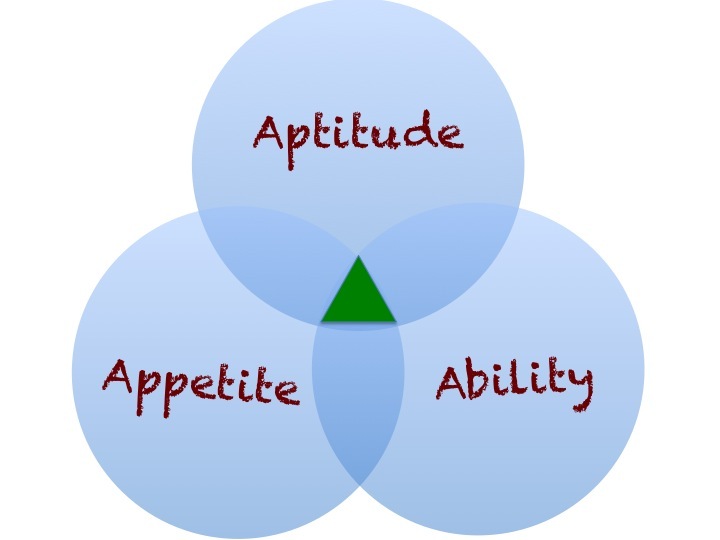 Appetite – Do I stir their appetite to learn, develop, and excel at various skills? Am I offering stretch assignments and projects? Am I inviting my team members to select those projects they want to dive into? Very few Rock Stars are simply born. Very few stellar employees just drop into companies or work teams. As leaders, the more we own the responsibility to find and develop our employees into Rock Stars, the more success our teams will experience. The next new hire you make – consider the 3 A’s of Engaged Employees. The next time you go to work, consider your current team and the 3 A’s of Engaged Employees – and what YOU can do to develop each team member’s Aptitude, Ability, and Appetite. This is Servant Leadership in action…knowing, caring, appreciating, and developing your people to contribute to the team’s success in ways that only they can. Leaders lead through serving their people. 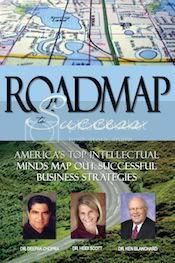 A leader’s roadmap to a successful team can begin today with acting on the 3 A’s of Engaged Employees. What if there was a simple mental model you could use as a tool to quickly assess the likelihood that the people you lead will be able to deliver what you ask of them? When it comes to increasing the quality and/or quantity of work, putting the right people on the right projects is for sure what we attempt to do. When we are after higher levels or better quality of production, we often prod or gently push our people to grow, develop, and improve. But are they equipped to do what we ask? Using the “Willing and Able Grid” provides leaders a quick snapshot of your team members – which can then be used to develop your people as you strive to bring the best output of each. 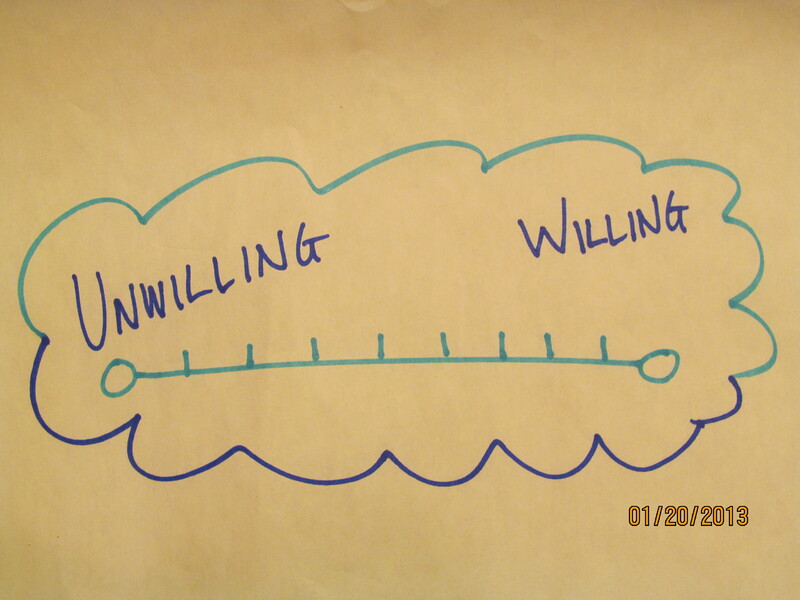 With a certain project, endeavor, or a specific type of improvement you want to see in a direct report, where on the “Unwilling or Willing” continuum would you plot them? Where would you plot them on the Willing Continuum? What evidence do you see and hear that causes you to assess if one of your people possesses a heart attitude of willingness or unwillingness to do, grow, or change the way you are asking? Related to the change, work, project results, or growth you want to see in this team member, what indicates to you that this person is Unwilling or Willing? Think of hitting “Replay” on an imaginary video cam in the corner of all workspaces to review the facts of how this person displays and conveys an attitude of willingness or unwillingness. Obviously we are looking for “Willing” souls who desire to grow, improve, and take on challenges. So when we assess a team member and find the scales tip toward “Unwillingness,” we may have some potential coaching to do. We may need to prepare and hold a direct conversation about the display of this attitude. That’s when the Replay function of the “camera in the corner” becomes useful. We can share as factually as possible (since a camera doesn’t lie) what we’ve seen, and check our perceptions. Hopefully we can nurture the desire within this team member to grow and improve. 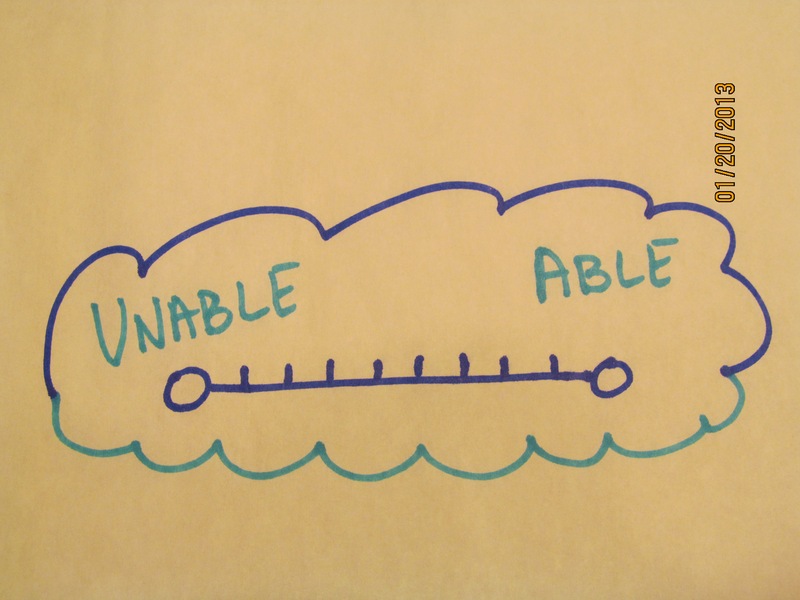 When assessing who the best person is for a project or endeavor, or when you consider a specific type of improvement you want to see in a direct report, where on the “Unable to Able” continuum would you plot them? Where would you plot them on the Able Continuum? Sometimes when we get focused on the outcomes we are after, we forget to assess the ability level of those we lead. Does she currently possess the Ability to do what I am asking or expecting? Does he demonstrate the aptitude to become Able to meet the expectation? As you honestly reflect on the ability level of one of your people related to a specific project or aspect of growth, if you find that he may truly be Unable to execute on your expectations today, then you know the responsibility rests on you as the leader to help him develop that ability. You will either need to provide opportunities for this person to learn, develop, and become Able, or you will need to look to others to get that job done. Finding one of your team members to be more Unable than Able related to a certain project or aspect of growth isn’t a bad thing! This new awareness provides us as leaders the opportunity to design an individualized plan of development for each of our people. 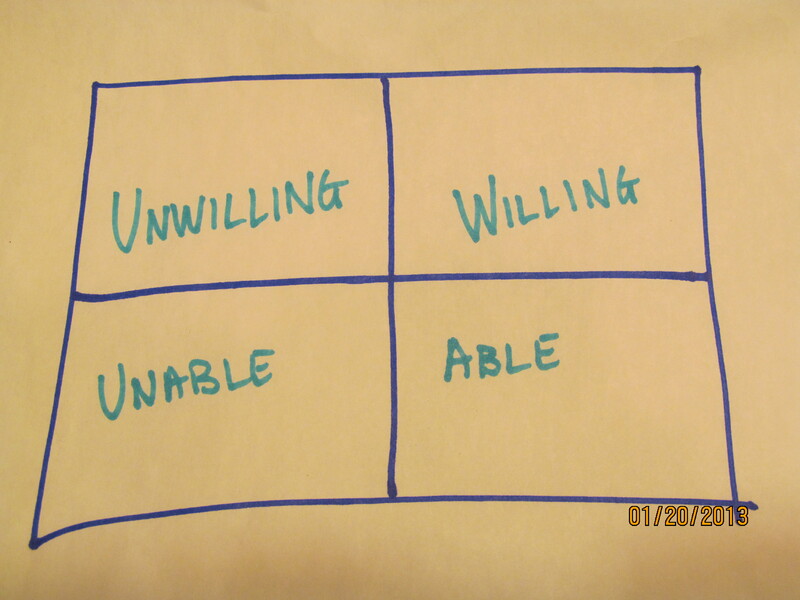 Using the “Willing and Able Grid” allows us to discern if what we are asking our people to do is going to get done! It allows us to discover how we can approach communicating with our people, optimally getting the most out of each of our people – because when our attitude is Willing, and our skill-set is Able, progress is on the horizon.